About 70 species widely distributed throughout the Northern Hemisphere, of which 29 occur in the FSU, mostly Asian (southern Siberia and the Far East) but also in the Caucasus. Their delicate and graceful appearance makes them truly desirable garden plants. However, some species are short-lived and decline after 5 or 6 years. A. flabellata Siebold et Zucc. Far East (Sakhalin, Kuril Islands) and northern Japan. Mountain forests, cliffs. Taproot short. Flowering stems about 20-30 cm. Leaves mostly in a rosette, long petiolate, biternate, loosely pubescent above, glaucous beneath. Flowering shoots leafless, with 1 to 5 flowers that are large, nodding, blue or lilac. V- from April, leaves remain green until late autumn, young leaves can persist through the winter. Fl - May (St Petersburg), for 2-3 weeks. Fr - July.. P - by seed. Requires semi-shade. Flowers the year after sowing. Z 5 (4). A. glandulosa Fisch. ex Link. Siberia (Altay, Sayans, Transbaykalia), Central Asia (Tarbagatay, Tien Shan), northwestern China and Mongolia. Alpine meadows, more rarely in forest zone, along stream-banks and on rocks. Flower stems 20-30 cm. Leaves biternate, nearly 20 cm long. Flowers 2 to 5, large, 3-5 cm diam., bright violet-blue or sky-blue. V - early spring to late autumn. Spring leaves appear Aprilwith later growing July. Young leaves can persist through the winter. Fl - May. Fr - July. P - by seed. Flower the year after sowing. Requires partial shade. Z 4. Caucasus, Balkan Peninsula, Anatolia and Iran. Forests and subalpine zones of mountains. Taproot short and thick. Flowering stems 40-60 cm. Leaves biternate, 20-30 cm long. Flowers 2 to 5, nodding, large, 5-10 cm diam., vary in color, mostly blue, with white recurves. Limb of petals colored to whitish. V - early spring to late autumn, some leaves usually overwinter. Fl - May for 2-3 weeks. Fr - July. P - by seed. Flowers the year after sowing. Does well in semi-shade. Good for the rock garden and flower beds. Z 4. A. oxysepala Trautv. et Mey. Far East, northern Korea, Japan and northeastern China. In forests and open woodland, along streams, in meadows. Flower stem 80-100 cm. Basal leaves 2 or 3-ternate, long petiolate, grey-green. Flowers horizontal to nodding, 5-7 per stem, large, sepals divergent, vine-red or reddish-lilac, petals pale yellow. V - April to October. Fl - May for three weeks. Sometimes flowers again in autumn. Fr - June. P - by seed. Does best in semi-shade on moist soil. Z 4. Eastern Siberia (Dauria) and northeastern China. In clearings in forests and in meadows. Flowering stems numerous 10-80 cm, branched. Basal leaves leathery, biternate, deeply lobed, with thickened margin. Flowers numerous, 2,5-3,5 cm across, blue with white petals. V - early spring to late autumn. Fl - mid spring for 2-3 weeks. Fr - one month after flowering. P - by seed. Requires a sunny or semi-shaded position. A very elegant species. Well suited for the rock garden and for flower beds. Z 4. New. Siberia and northern Mongolia and China. In mountain forests, clearings, subalpine meadows. 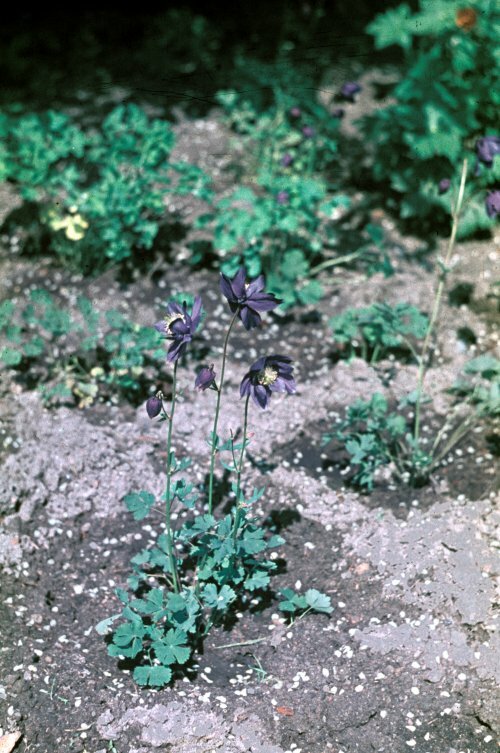 rocky slopes, on 1,600-1,800 m .
Flowering stem 30-70 cm, branched. Basal leaves ternate, grey-green. Flowers 5-7 cm diam., light blue with white or pale cream petals. V - Growing season from April until October. Fl - May, June for one month. Fr - June-July. P - by seed. Resembles A. flabellata. Does well in semi-shaded places with moist soil. Z 4 (3). Some species from Central Asia and Siberia merit also horticultural attention. A. atrovinosa Pop. ex Gamajun., with vine-red flowers, Tien Shan and China (Dzhungaria); and three species with blue numerous flowers A. karatavica Mikeschin, Tien Shan (Karatau); A. turczaninovii R. Kam. et Gubanov, southern and eastern Siberia; A. vitalii Gamajun., Central Asia (Dzhungarskiy Alatau), can be used in the rock garden and in the wild garden in semi-shaded places. Z 5 (4). All are new.